For more information, read How to Care for Day Old Chicks. Read my Review of the Hova Bator 1602N Incubator. 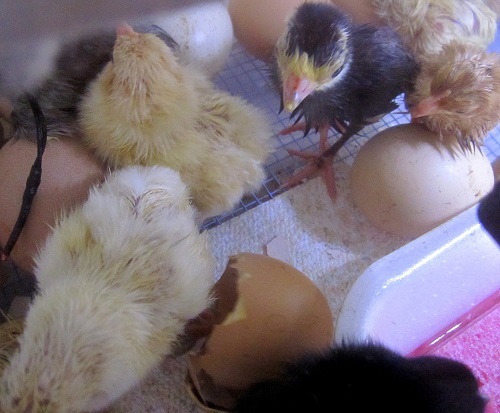 This guide shares step by step instructions for hatching chicks in an incubator. Incubator Warehouse sells the Hova Bator 1602N incubator, plus many other incubators, hatching supplies, and poultry supplies. If you are low on time and energy, there are incubators available that will automatically turn the eggs and keep the proper temperature and humidity levels. You will need to spend more for these features, of course. Basic incubators such as the Little Giant model are much more affordable and will do a great job. 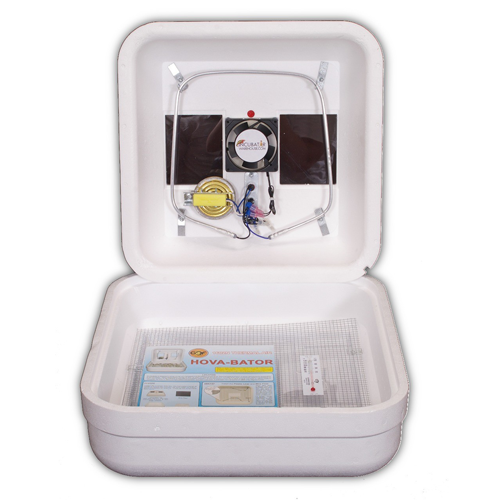 If you take a small step up in price and purchase the Hova Bator 1602N incubator, you will also receive the circulated air fan kit to provide a more even temperature for the developing embryos. Some folks will even opt to build their own incubator with these parts available through Incubator Warehouse. You can even create your own incubator from a kit. Photo source: Incubator Warehouse. Place your incubator in an area where the temperatures are between 70-80 F and remain stable throughout the day, for best results. Avoid areas where the sun will shine on the incubator, or drafts or a heat duct will blow on it. The most common incubators do not have an automatic thermostat that keeps the interior of the incubator at the proper temperature at all times. So fluctuating room temperature may reduce your hatch rates. Make sure your incubator is level and safe from pets and young children. New Incukit Mini installed and heating up. This kit upgrades a still air incubator with disc thermostat to an incubator that keeps a constant temp and circulates the air for more even heat distribution. Follow the manufacturer’s instructions for installing the thermostat or air circulation fan if necessary and this is your first time using the incubator. If appropriate to your model, place the plastic liner and wire floor in bottom of incubator and fill the humidity trough with water (check the instructions for directions). Plug incubator into a power strip with surge protection (plug into a secure outlet, where it won’t be pulled out or jostled), place a thermometer inside the incubator (or use an Incutherm Plus Hatch Monitor) and allow temperatures to stabilize. Adjust thermostat so that interior temperature is 99.5 degrees Fahrenheit for best results. Unless you have a pre-set thermostat (shown above), you may need to adjust the thermostat several times and check the temperatures over a day or two before adding eggs. 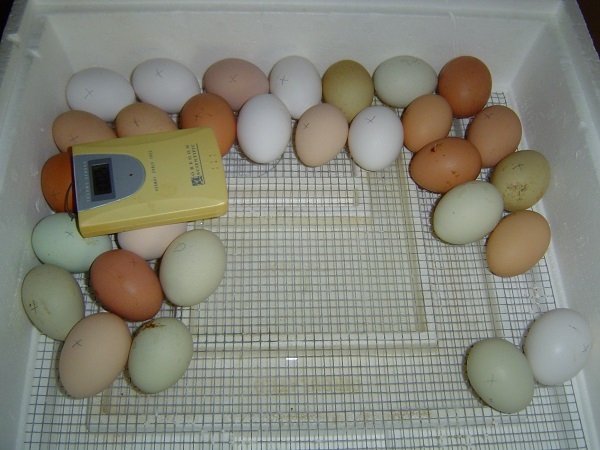 It may be difficult to adjust the temperature to exactly 99.5 F, but do your best to keep the temps between 98.5 and 100.5 F. When the temperatures have stabilized inside the incubator you are ready to add eggs! Market with x on one side, o on the other side…to keep track of turning. Chicken eggs require 21 days at temperatures of approximately 99-100 F to hatch successfully. I try to maintain a temperature of 99.5 F to 100 F. Make sure that you will be able to care for the incubating eggs during the hatch period. Mark each egg with an x on one side and an o on the other for keeping track of turning (unless you have an automatic turner). Lay eggs on wire rack in the incubator so that all eggs have either the o or the x facing up. Place thermometer level with the top of eggs for an accurate reading. Every Day: Turn eggs 3 times (or more) each day so that embryos do not stick to the inside of shell. Check the humidity tray to make sure that the water doesn’t dry out. Add warm water to tray as needed. Make sure you don’t get the eggs wet when you add water. Don’t keep incubator open any longer than necessary to turn eggs and add water. Check temperature several times a day to make sure the eggs are not getting too cold or too hot. Be careful not to adjust thermostat too much or too often for best results. You may wish to candle the eggs several times during the hatch to see how they are developing. Be sure to minimize the time spent handling them. About half way through the hatch period the embryos will begin producing their own body heat. It is necessary to watch for rising temperatures at this time. Adjust the thermostat slightly to keep the temperatures at approximately 99.5 F. Watch for the temperature change around day 10 to make sure the embryos aren’t overheating. Three days before the hatch date, stop turning the eggs. If you have an automatic turner, remove it from the incubator at this point and lay the eggs on the wire floor of the incubator to prevent injury to the chicks. Leaving the eggs still for the last three days allows the chicks to assume hatching position so they will have an easier time pipping through the shells. You might want to place some paper towels under the eggs at this point to make clean up of your incubator easier. Do this quickly to prevent chilling the chicks. You will normally hear the chicks peeping in their shells for a day or two before the eggs hatch. Your cat or dog may notice this before you do! You will probably have trouble controlling your impulse to help chicks break through their shells and remove them to their brooder right away. However, it is important to let them work their way out on their own and keep them in the brooder until they are dry. If you remove each chick as it hatches, the temperature and humidity levels in the incubator will drop, exposing the rest of the unhatched chicks to cold and dry shells that are harder to break through. When you have a number of chicks hatched and dry, remove them quickly, if you must. Be prepared to adjust the thermostat to keep the temperatures stable. Note: If you have a chick that is having trouble hatching and seems weak (not just resting) after a long period of time, you may want to help it out a little. Be sure that you keep the chick warm and the membrane moist. Take care not to cause bleeding by pulling the membrane off too quickly. I’ve only had to help a chick once. After almost 24 hours of trying to break free, the chick was exhausted. I successfully pulled enough of the shell away, carefully, so that the chick was able to finish the hatch on its own. I would only do this as a last resort, however. Make sure you have the brooder set up and warmed to the proper temperature for a day or two before the chicks are due to hatch. 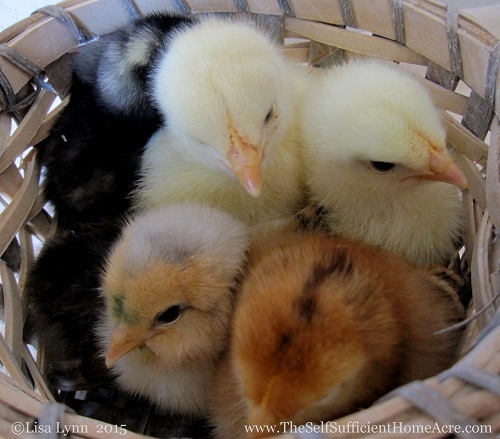 For instructions on caring for your fluffy little peeps, check out my article How to Care for Day Old Chicks. Are you hatching chicks in an incubator this year? Have you ever hatched other poultry besides chicks? I enjoy hearing about your experiences! Disclosure: I received an incubator from Incubator Warehouse to review prior to writing this article. Best wishes with your chickens! Thank you for stopping by to visit! Hello, I have a question, what would happen if you removed your automatic egg turner too soon? like day 13? I am just finishing up my first hatch in 15 years and we had eggs that where up to 5 days apart (will not ever do it again) so far we have lost 1 chick out of 28 (not counting unfertilized eggs which we ended up with 3 of those) I am asking because yesterday we had to help a chick hatch that was not coming out on it’s own it had been pipped for over 24 hrs and appeared very exhausted we chipped away the shell leaving the membrane, came back about 6 hrs latter to zero progress (didn’t appear to even be trying) so at this point it had been almost 48 hrs since it first pipped, I got worried and carefully chipped away enough shell to allow the chick to simply move away from the shell taking note that the membrane was really tough I had to pull it away, I noticed also that the chick was not in a good position it was cross ways in the egg and after hatching has splayed legs (the feet point to the sides) we tried a brace to no affect, but other than that the chick is health, it just can’t walk as it appears his legs are working in opposite of each other. any thoughts of how this could have happened? And what I should do? The normal development of their legs depends on the eggs being turned an odd number of times each day (an odd number so that the same side of the egg isn’t facing up overnight every night…too long in the same position). Because the eggs weren’t turned the way a hen would do instinctively, the chick’s legs didn’t form properly. This development is so tricky that just forgetting to turn the eggs a few times, or leaving the same side up over night a lot can cause the same problem you are having. They should be ok. Just make sure that they are turned regularly until 3 days before hatching and all should be well. Because it was so early in the hatch, your chicks are probably ok. As they get larger and more developed, it causes more problems with their leg formation. Turn them 3 or 5 times a day for the rest of the hatch to give them the best chance. I think it would be best if you didn’t turn them any more. They need 3 days to get into position for hatching. If you are off by a day on your age estimate, they should still be fine. Hope you have some cute little chickies in a few days! I’m in the process of collecting eggs several times per day (because it’s so hot here..105° today) to place them in the wine fridge for holding. I have a cardboard egg carton to put them in. Should I line it with a paper towel or just leave it as it is? It’s a used one…thanks! Unless the carton had dirty eggs or eggs contaminated with a disease, you can just use it the way it is. If it is dirty, I would toss it and get a clean one. After hatch day I wait another day or so and fill up a Tupperware dish of 100* water. I drop all later bloomers in that haven’t pipped. Once the water settles, if any of the eggs moves, you have a live chick. Remove immediately and put it back in the incubator. It as driving me nuts not knowing who was still alive in there! I never heard this suggestion before…thanks for sharing! It is certainly less invasive than cracking them open and the extra moisture may help them hatch. Wow, Charlene! That’s pretty amazing 🙂 I have read that if the temp is a bit low the chicks may hatch a day or two late, but never heard of them hatching this late. I will also start letting my incubator go longer just to be sure. Also, if the temp is a bit too high, they may hatch a day early. These are temps that are consistently 1 or 2 degrees too high or low, I believe. Much more than that and they are unlikely to survive. So, do you know if the temps were off? Just curious! Hi and good morning! The temperature ranged from 99.5-100 consistently and the humidity ranged from 44-51.. we just have one of those Styrofoam still air incubators..I believe it’s a little giant brand.. I always find it interesting to hear about other peoples’ experiences…so thank you very much for sharing! For the last 3 days, they need a higher humidity, somewhere in the 70% range, to make it easier for them to break through the membrane. I wonder if that had an effect of the hatch time. I’ve started putting a small dish with a wet sponge in the incubator, right under one of the air holes. This way I can use a funnel to put a small amount of water on the sponge to increase the humidity. The incubators I use have circulating fans that dry the interior out so fast that I have to add water several times over the last 3 days. Thanks agian for the updates! Wow! That’s great! 27 days since the first egg hatched? or 27 days since they started incubating? 27 days since momma started sitting. Sorry..I was a tad excited! The first egg in the clutch hatched a week ago now. This morning we have a beautiful, healthy yellow chicky! I thought that was what you meant 🙂 How exciting! I’ve always turned the incubator off a couple of days after the hatch…maybe I need to rethink that! Just an update here…went to the hen house yesterday around 4:30pm (west coast time) put my hand under the hen that had recently hatched a little one, lifted her up a little, blocked her vision with my arm and placed the day old one from the incubator in front of her in the nest box. She saw it and started clucking at it. It began peeping at her. They did this for about 5 minutes along with gentle pecking then she raised up and scurried it underneath her. 7pm same night, checked on her when we went to clean the barn and both little ones were in front of her in the box and she was showing them how to peck for food! Sooo cute! This morning all was well! They were both under her staying warm! Yay! It was a success! How wonderful! I’m so glad she accepted the little one so readily, Charlene! Keep up the good work! Thanks! I have a question for you. I have heard about taking eggs and “keeping” them in a coolish spot for up to ten days after they are layed before you put them in the incubator. We have a wine fridge that has a range of 46°-66°. Have you ever done this? The reason I would do it is because I would like the incubator filled and have them all on the same schedule. I’ve heard 50°-55° is where the temperature should be for storage. What are your thoughts? There are a ton of different opinions on this. I have always kept them at room temp as long as it is 80F or less. But I read on several sites that 55F and 75% relative humidity is best. Some people say 45 – 55F and others say they have hatched refrigerated eggs with good hatch rates. I think if you keep them in the warmest part of that wine fridge, they will probably be ok. Good luck! 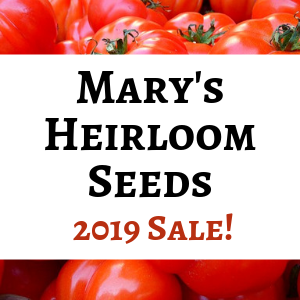 Have you had good success keeping them at room temperature? How long did you have them before you incubated them? There is no humidity settings on the wine fridge so I’m not sure now if that would work..
You can get a device to measure the relative humidity, but I think if you just put a plate with a wet sponge in the fridge too, that would keep them humid enough. I haven’t tried this…but it should help. If it is too dry, the moisture in the egg can start drying out too much. If you can try it at 55F, that might be better. I wish I had something that I could set the temp! If you think about it, when a single chicken that is loose on the farm or in a cage alone, starts to set (12 to 14 eggs in the nest) the first egg in that nest is either 12 to 14 days old when she starts to set. They have been sitting in the nest at whatever temperature it is and humidity. We had many chickens when I was young and when my father wanted more, he would put a rooster and a hen in one of his brood pens, and let them be until he saw the hen setting. Then he would remove the rooster and put him elsewhere, and generally most of the chicks would hatch. It’s great that you were able to put them in the incubator! Hope the little ones are doing well! So far so good! Going to introduce it to one of the hens that hatched a little one last night…we shall see if she will accept it.. Try putting the little one outside the nest and a little bit from the hens…and see how they react. I tried to put a chick under a hen once and she started pecking it…so I don’t want to do that again! I also put little ones in the same room with the hens and they came over and adopted them after a little while. Best wishes! I will try that! Thank you so much! I will let you know how it goes! I have a egg that hatched early on day 20 and now it is almost the end of day 21 and nothing has happened is this normal ? It is normal for eggs to hatch over a one or two day period, but usually there are eggs hatching every so often. If you opened the incubator to remove the first chick, it could have cooled the eggs and reduced the humidity enough to cause problems for the others. It is also possible that the others will still hatch up to 2 days after the first one. I have had chicks hatch from day 20 through day 23…so keep the temp and humidity at the right levels for another day or so and then take each egg out, listen for any sounds of pipping from the egg, and if there isn’t any sound, you can try gently cracking the egg open to see if there was a chick that died when it should have hatched. I have another post about problems that affect hatching that might help. I had one egg hatch on day 20 and now its almost the end of day 21 and nothing is happening is this normal ? Having my quail eggs for the first time ready in my incubator for a week now and still can’t stop reading different articles as I may find something different or thought of something which didn’t notice before. Reading your article got another question clicking. I have a full automatic incubator. Do I need to off the incubator during the last three days after I disconnect the turning device? If I understand correctly, you are wondering if you should turn the incubator off for the last 3 days…and the answer to that is NO. The babies need the heat and humidity all the way through incubation, so turning off the incubator will kill them. You just don’t want the egg turner to turn the eggs any more so that they babies can get into the proper position for hatching. Keep them in the incubator until all of them have hatched and then move to a brooder with temps at 95 degrees Fahrenheit. Thanks Lisa, yes I was not sure to turn the incubator off or not. And now I don’t have to worried about that. Hi Lisa, get some hatched chicks already this morning (EAT). Just to be sure. This means I can continue to keep them inside the incubator for 24hrs without food or water? Yes, you can leave the chicks in the incubator for a day without food or water. If they have all hatched, then go ahead and move them to the brooder and dip their beaks gently into the water to teach them to drink. Chicks are born with a 3 day supply of food and water from the yolk still to keep them alive. That is how they can be shipped for up to 3 days from hatcheries. However, as soon as I feel that all of the viable eggs have hatched, I move them to the brooder so they can start drinking and eating when they are ready. The only thing to be careful of is if your incubator has a fan on the underside of the top cover. If the fan is not contained in a ‘cage’ the chicks can be injured by the spinning blades. If you aren’t sure, I suggest that you leave the top on instead of checking, because that will let the humidity and heat out and could prevent proper hatching. It’s hard to keep it closed, but it is important. Best wishes! Hi Lisa, Just like to share my feedback. I did keep 127 quail eggs in my incubator. Exactly the 17th day. 75 hatched. On day 18th, another 7 quails hatched. On day 19th another one quail hatched. Hatching rate is 65% while I was expecting only 50%. That’s more than what I was expecting. Smile. Now we are preparing to keep another 300 eggs for hatching. I will share my feedback when they are ready. I had put water in the incubator as required,i even add some water around the 10 day period. The temp stayed on the required temp.on the day of hatching i woke up and realized there was no water.i added very little. Im not sure how long it was without water. Also i forgot to take them out of turner till the 20th day..will my chicks still hatch and be alright? It’s pretty iffy. Without the proper humidity, the chicks and shells dry out and can die or not be able to peck through the shell. With the eggs in the turner too long, they will not be turned the right way up to peep out of the shell. Unfortunatley, the only way to tell is to wait and see what happens. I hope your chicks hatch ok.
Will it hurt to eggs touching each other? It won’t hurt anything if the eggs are touching each other. Just make sure you are turning the eggs properly. Best wishes! Hi Lisa, I am considering buying a 10,000 capacity incubator, which type do u recommend I buy! I’m sorry, I have no experience with an incubator of this type. I’ve only used the small desktop type, since I only need a few chickens. Let me know if you find one and how you like it! i have a hen that’s setting an I went to check in an found two eggs been ate. We removed to roster an just left her there. My husband said he seen a baby chick but it was dead. I have tried lookig but haven’t seen anything but broken eggs an the eggs she is setting on. I have always been told that if I touch the eggs she will not set anymore. What should I do because I’m smelling a band smell now. I also incubat an my chicks have already came an she is still setting. I’m starting to think we have a bad hen. What should I do guys? I new at this. If you have a smaller crate, I would move her at night to the crate (nest and all ), and then you can remove eggs one at a time and candle them to look for movement. There’s several factors that could be to blame..dirty nests, more dominant hens, nasty roo, young/old hen, etc that could cause the issues with busted eggs/dead chicks so I wouldn’t blame her unless you catch her killing her chicks. Another hen could have been mad over her choice in nest spot and wanted to lay there, which wouod mean eggs could have been tossed out of the nest during the struggle, a roo could have not taken no for an answer and trying mounting on the nest, with the same results. ..
You can reach under her any time and remove eggs without her abandoned the nest from the smell..however, some hens are odd and the disruption may irritate her enough to leave the nest so that is why most people will do it at night, the upset much less after roosting. Right now I have a broody hen sitting on a large clutch yesterday I found an egg broken next to the nest with a fully formed chick inside it looked like the hen pecked it should I take the remaining eggs away and place them in the incubator? Thanks for answering this, BJ D…I’ve been busy and unable to check my comments every day. Good ideas! Very welcome hun..dunno why it has my name as BJD..I am the same Bobbie Jo from above.. matching profile pics and different names..lol. I’ve been talking a friend through her first hatch the last month and she’s introducing mama n chicks back in the flock today..
Hope all is well on the farm..it’s been horrid hot here but had a doozy of a storm yesterday..thankfully it blew through kinda fast. Thanks for clarifying, Bobbie Jo! Thank you for your help. I’m so scared to mess with them but I also don’t want to loose them I want my blue orphington babies! Wait til tonight a little after dark..take some other eggs(infertile or not incubated) and swap them out for the ones under her. Candle the eggs and see if you can see movement..if they’re too dark or too far along to see movement, then look for veining up near the air cell. A hen will sometimes push eggs out if there’s something else going on with the eggs, or if she is where other hens can get to her, they may be bullying her and in the process of the fighting, the eggs got pushed out. There may be another hen trying to steal them..
anyways, after you candle and see if they’re still alive then it’s up to you on whether you want to finish them in a incu or let her..If you’re going to let her, then I would suggest moving her into a dog crate or some place alone and separate from the rest of the flock. Actually, if you plan on using the incu but still sneaking the chicks back under her, then I would move her too. You can visit Backyardchickens dot Com and there is a section called Hatching 101, it has pics of several stages of incubation during candling, so you’d have an idea of where the eggs are. You don’t have to be a member to view the articles on that site. I’d let your incu dry up, 60% is about max when I’m hatching, kinda high for being a lil earlier. Especially down where you’re at..
Lol…no problem, Bobbie Jo! Thanks for giving all the great info here 🙂 Jessica, I hope you have a good hatch! Best wishes! It is unlikely that they survived, the last 3 days are the most important for keeping the temp and humidity levels just right. To be sure, keep the incubator plugged in for a couple of days to see. If they don’t hatch, take an egg outside and crack it open to see if the chick is dead. If so, go ahead and check each one. I don’t use a turner and just turn the eggs by hand, so I am not able to answer your questions about the turner. But I think that jiggling the eggs is probably not a good thing. So please follow the advice shared by Bobbie Jo. Also, since I don’t use the automatic turner, I do open the incubator every day of the hatch up until the last 3 days during lock down. I haven’t found a high incidence of embryos dying during that first week from having the incubator opened. Lisa is right..a hen will still get up off her nest to eat, drink and poo..a lot of newer fancier incubators have “cooling time” built in now instead of straight heat..it takes a while for an egg to loose built up heat, so the little bit of cooling they may go through while turning is completely normal. I usually use a turner, but just for experiments sake I hand turned my last hatch..I had ready some where that a the most successful hatches were after 92 or 96 turns a day..so I basically messed with the eggs every time I thought about it..my hatch was pretty successful with 4 out of 5 hatching..
Lisa, I apologize for answering questions meant for you..I’m a hatch-a-holic and love to talk about chicks and hatching..
No problem, Bobbie Jo! I admit freely that I don’t know it all and I can’t always answer quickly when life gets busy…also, I enjoyed reading your replies. 🙂 Feel free to answer questions! I love your blog btw, not just the chicken stuff..lol.. I live in WV, just bought the farm I lived on as a child. .my parents have always been all natural/organic farmers..even before it was cool or ‘a thing’.. I work in horse rescue, and run a free equine program where we give free lessons, have programs for kids over the summer and after school and we do free therapy sessions for kids and veterans on or with the horses.. Thank you so much, Bobbie Jo! That’s amazing that you were able to take over your parents’ farm! And the work you are doing is just wonderful…there are so many horses that have been abandoned, neglected and abused…it breaks my heart. 🙁 To hear of all the amazing people who take them in and give them a new life is so heart warming! Thank you for doing what you do! My hat is off to you! what is causing my egg turner to vibrate making noise? Will it hurt my 1 day old embryos? If it’s vibrating hard enough to jiggle the eggs it could hurt them..
check to make sure the motor (silver round thing) is tight..there should be 2 screws..
Bobbie Jo will it hurt if i take the eggs off the trays? What can be wrong with them? This early, hopefully the embryos are fine..it really just depends on how rough the tray vibrated..another thing I forgot to add is if you are uncomfortable keeping your incu open long enough to turn all the eggs, cut the bottoms out of egg cartons and just set your eggs in them..then you can use almost anything to rotate propping ends of the whole carton up..
That’s a great idea, Bobbie Jo…thanks for sharing! Take the eggs out of the turner and take your turner out of your incu so that you don’t have to worry about your eggs while ..then check all of the rows of trays to make sure they are all sitting in the frame the same way..try to jiggle it with your hands and see if the trays move (they shouldn’t ).. then, grab the motor (making sure it is not plugged in), and see if it moves..it shouldn’t ..make sure it is perfectly upright and tighten down the 2 screws that hold it on.. I really hope this helps..it just sounds like something minor to me..this is all assuming that your turner is like the one that goes in an LG or Innovator..
We just did a batch and lost several formed chicks in the egg. I have an automatic turning tray but we still rotated them by hand as well (end over end). Should we not do that because we have the shifting trays to move the eggs? I just keep hearing how important turning the eggs is but wondering if I should still do it with the automatic turner (which doesn’t really turn the eggs it just rocks them). I want to do it right next time and hope leaving them alone will help. Is it more of an issue of humidity and temp rather than handling? Just so unsure. I don’t use an automatic turner…so I’m not sure if yours is working properly or not. I thought they were supposed to move the egg from side to side, although not end over end. The reason for turning is to keep the embryo from sticking to the shell and so that their legs form properly. If the legs do not form properly, they may not be able to break free from the shell. If you opened the incubator during the last 3 days to add water to the humidity trays, or to remove chicks as they hatched, that can cause some of the chicks not to hatch. The temp and humidity drops and they get chilled or the shell is too dry and they can’t break through. There are a lot of things that can go wrong…so I’m not sure if this addresses the problems you had. Try reading through the post I wrote about common hatching problems… I hope this helps! You don’t want to do any additional turning to what the auto turner does…flipping them end over end doesn’t allow the air sac to develop properly and will affect how the Chick can position itself. The egg must stay fat end up throughout incubation(in a turner)..if turning by hand I still elevate one side of the incubator and then make sure fat ends face that way. Also if using a still air incubator (one without a fan), you’ll want your Temps to be a little higher ..101° to 102° to allow for difference in layers of heat without a fan to circulate the air. I had always used a desktop incubator that had instructions for filling humidity tray #1 for the first 18 days and then filling trays #1 and #2 during the 3 day lockdown period for hatching. I recently read a good post about incubating eggs that informed me that the humidity should be around 40-50% for the first 18 days and then it should be increased to 65% for the last 3 days. They said that if the humidity is too high for the first 18 days, the air sac in the large end of the egg will not shrink enough and the chicks could drown before they are able to pip through the egg shell. Since I read that, I have started a new hatch and I am hoping that I’ve kept the humidity at the right levels. I’m still using the humidity tray instructions from my incubators. However, I plan to purchase an instrument for measuring the relative humidity in the incubators soon so I can keep a better eye on the levels. Do you know if the humidity might have been too high for the first 18 days? When the chicks hatch, they will always be wet, not fluffy. But they should be able to break through the egg shell without having a puddle of liquid around their heads. I hope this helps. Let me know if you can provide any more info about the problems you are experiencing and I will try to help you trouble shoot the problem. What humidity level do you recommend during hatching? The humidity should be around 65% during the first 18 days and then increase it to 75% during the lockdown period (last 3 days). I’m reading such a variation on what the best humidity levels should be for hatching. After more investigation, I think that the numbers I listed in anwer to your question are too high. It sounds like the best humidity is 45-50% for the first 18 days and 60-65% for the last 3 days. What kind of incubator do you have? No, the water stays in the humidity trays, but that is beneath a grate in pre-made incubators. The water in the humidity tray is important for a good hatch. You want to have a high level of humidity inside of the incubator or the shells get too dry for the chicks to crack through the shells. Thank you for that awesome article! I just bought new incubator because I have a few chicks six or seven months from winter and these young hens often will lay in winter when others don’t. Is there a chance to give me some more indications? I already checked a few web pages like this one http://incubatorsatilir.meximas.com/index.htm but I still need some help. Thank you! I couldn’t get that page to load, unfortunately. 🙁 And I’m unsure what your question is. Could you let me know exactly what information you are looking for? Thanks! Surprise, surprise!!! Today is hatch day for my Maringtons – Maran/Orpington cross – so far, there are 7 little wet chicks in the incubator. I am using Farm Innovators Model 4200 Pro Series Circulated Air Incubator with Automatic Egg Turner. (Amazon ad indicates it will hold 41 eggs but mine holds 42.) I removed the turner on Monday afternoon as I wasn’t expecting the hatch until tomorrow. I have only 1 rooster for 13 hens so am interested to see what hatch rate we end up with. I did everything just as you suggest, other than marking my eggs since I have the automatic turner … and, another thing I slipped up on is that my brooder is not ready for them, even yet. I won’t be able to get that done now until I get off work this afternoon so they all stay in the incubator until tomorrow! Thanks again for a great review and article! Oooo, I have rotten egg smell on the brain just reading this! Sorry to hear about your bad hatch. 🙁 I wonder if you can use vinegar? I think it would be a good idea to contact the manufacturer to find out what they suggest. I’ve never had this happen, so I’m not sure what would work. I have a stain and odor remover that I use for cleaning up pet messes that works quite well (better than anything else I’ve tried) for odors…it’s called Bac-out by Biokleen. But I don’t know if that would be safe for the styrofoam. As for the chick dying, sometimes it happens when the humidity levels are too low, there isn’t enough oxygen in the incubator, the incubator is opened and closed too often causing temp swings, or they get too warm or cold. I assume that it isn’t the temp, because you mentioned that…but maybe the oxygen or humidity levels? I hope you have better luck with your next hatch! The oozing is a result of you putting the eggs from cold to hot thus causing an expansion. I’ll have to start from scratch. I’ll start by doing a search on the dual purpose breeds disposibles in my area. I know that in Quebec, to the early 1900s, it had created a race (the Chantecler) from Cornish, White Leghorn, Rhode Island Red, White Wyandotte and White Plymouth Rock. This breed is very rustic. They have a small ridge and small wattles, which minimize the risk of frostbite during the winter. For now, I must do my homework so you do not buy anything. I would probably choose an incubator like the one you are using. I like the principle of always buy the best quality tool, but always taking into account my real needs. If it is beyond my means, rather than buying something bad, I just prefer to wait. Thank you for everything and do not worry, if I need you, I will not hesitate. The Chantecler is supposed to be one of the most cold hardy breeds. They are also in danger of extinction…so it is wonderful if you raise them! I’m glad you brought up this topic. I plan to buy an incubator shortly. Until now, I always bought the chicks of one day. I bought 50 chicks in May and 50 in September. Your article is timely because I know nothing and that is why I hesitated. Glad I could help 🙂 If you have any questions about what kind of incubator to buy…let me know! Best wishes with your incubation endeavors!